All signs point to Gleyber Torres making his Major League debut with the Yankees this season. And probably sooner rather than later. But that is not why baseball's No. 5 prospect was removed early in Triple-A Scranton/Wilkes-Barre's 6-1 loss to Gwinnett at Coolray Field on Monday night. After going 0-for-2 at the plate with two groundouts, Torres returned to third base -- where he started the game on defense -- for the bottom half of the third inning. In the fifth, he was pinch-hit for by Cody Asche. MLB.com reported after the game that the top Yankees prospect was pulled for precautionary reasons. Torres was experiencing some stiffness and the cold April temperatures may have contributed to that. It was 48 degrees on the field. 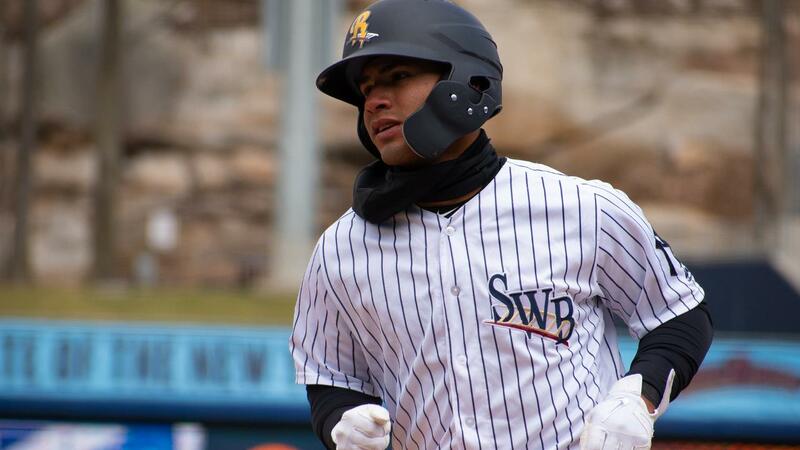 The 21-year-old was named the International League Player of the Week on Monday after hitting .385/.405/.564 in 10 games with four extra-base hits, 10 RBIs and five multi-hit games for Scranton/Wilkes-Barre. His 10 RBIs stand second to teammate Abiatal Avelino (12) in the International League. And Torres actually began the season in a 1-for-9 slump. The Yankees have plenty of incentive to hold off on promoting the standout infielder. If the organization waits until Wednesday for the call, that will give Torres 20 days in the Minors as a member of the 40-man roster and New York will have an extra year of control before he hits free agency. A promotion before then would enable Torres to hit free agency in six years instead of seven. New York general manager Brian Cashman has been insistent that this is not part of his evaluation process. He told MLB.com, "We're trying to win games. Every win for us is valuable." Since being acquired by the Yankees from the Cubs at the 2016 trade deadline in the Aroldis Chapman deal, Torres has risen through the system quickly. Cashman told reporters the Venezuela native might have been called up last season if not for a shoulder injury that required surgery and ended his season prematurely. In 13 games this spring with New York, Torres went 7-for-32 with three doubles and an RBI. Avelino knocked in the RailRiders' only run on an RBI single in the fifth. Jaff Decker got Gwinnett on the board with a solo homer in the first. Rio Ruiz drove in two and Christian Colon went 3-for-4 with an RBI for the Stripers.